"Humans generate underwater noise the moment we take to the water," said Erbe, who studies big sources of underwater sound on behalf of industry and defense. She also said that out of general scientific curiosity she wanted to find out just how loud we are individually. "Many people don't realize that sound travels extremely well and far underwater—we can hear individual ships tens to hundreds of kilometers away. And when we're out on the ocean, we can hear ships coming long before we finally see them appear on the horizon." Man-made noise is a problem underwater because marine animals rely on sound for all their major life functions like foraging, traveling and mating. "To understand how much interference we cause marine animals, we need to measure the sounds we generate underwater," Erbe said. "To do this, we deploy hydrophones—essentially underwater microphones—to record the sounds of passing ships or, as in this study, people swimming over the hydrophone." When testing in a pool, Erbe and colleagues were surprised to discover just how noisy humans are underwater. 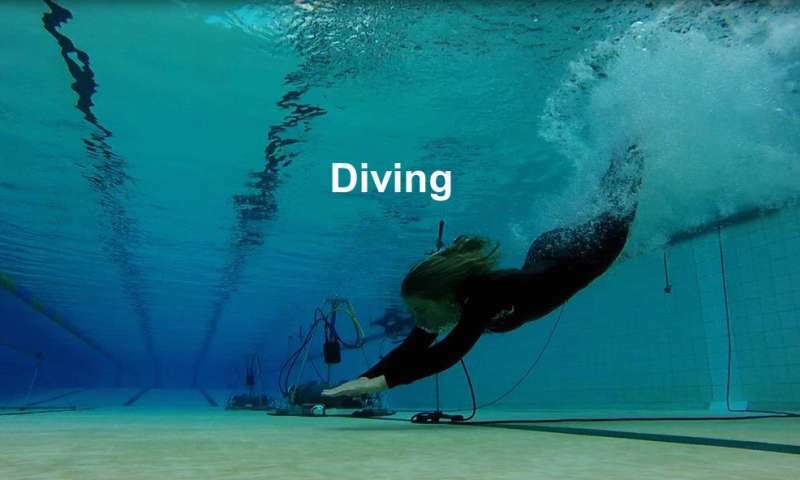 "Thanks to simultaneous underwater video and audio recordings, we were able to match specific sounds with activities—including different swimming styles, diving, kayaking and scuba diving," she said. "It turns out, most of the sound is related to bubbles that we generate at the water's surface. Every time your arms pierce the surface while swimming freestyle, you push a bubble cloud underwater, which vibrates and sends out an acoustic wave." As you might guess, swimming breaststroke is much quieter than freestyle. In fact, after watching others within the group swim each style just once, the researchers were able to tell, while listening blindfolded, who swam which style next. "Some of us use much more force in swimming than others," Erbe said. "For example, some swimmers exerted more energy vertically downward—pushing huge and noisy bubble clouds underwater, while other swimmers used their energy more in a forward-propelling sense and created much less bubble noise vertically below them."